This month we are running an exclusive promotion with minicabit, the cab price comparison app. Our readers will get 10% off every ride throughout May, so if you are heading to the airport this weekend you might want to take a look. Minicabit is a minicab comparison service that helps its users find the best rate from competing local operators. The company was founded seven years ago and has grown its network to over 800 licensed cab operators in over 300 UK towns and cities. The company is an official booking partner for blue-chip organisations such as London City Airport, Heathrow Airport and Ascot race course. As airport transfers are a key market for minicabit they have approached us to offer an exclusive discount to our readers. What’s great about this promotion is that it’s not a one off discount, but rather a discount on every single ride taken booked with minicabit in May 2018. Simply enter your journey details and book via the minicabit website or download their app, create an account and book from there. 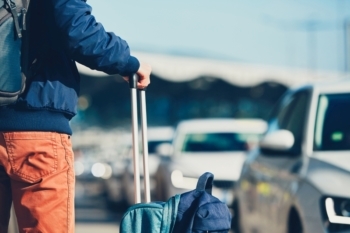 When you book a ride you can enter any luggage you have and minicabit will automatically work out the right size car for your trip. For example minicabit has cars that take up to 16 passengers and also cars that take pets. You can book your rides up to 12 months in advance and minicabit will search for the cheapest fare available from operators both near your pick-up location and also near your destination. This is something you are unlikely to do yourself – if you lived in Sheffield and wanted to go to Doncaster, you might ask a couple of Sheffield firms for a price but you are unlikely to start researching Doncaster taxi firms who would also be happy to drive to Sheffield, pick you up and then drive back. Every time you book a minicab through minicabit in May and use the promo code HFP you will get 10% off the final price. Simple as that! You pay minicabit directly, not the driver. You’ll be pleased to know that American Express is accepted! The minicabit website is here. An interesting offer but after the discount the price is about twice that of going direct to local taxi companies. Used for the first time about two years ago. Minicabit failed to pass order onto taxi firm and booked minivan failed to turn up. The *shrug* “what do you want me to do about it” response even more annoying. In the end ordered two ubers to get group home. Took four days to investigate and refund. Given a £10 discount off next booking but too unhappy to use again! Had the same experience about the same time ago. Difference was I was still billed and only when threatening a charge back did anything happen… And Uber doesn’t exist where I am! I use a very similar service (Taxicode) for business travel, the value for me is that I can use my corporate Amex and get a PDF receipt; most minicabs local to me either don’t take Amex or only take cash. It’s a bit more expensive than going direct but obviously I’m not the one paying! I would say that the service offered by the cab companies available through those apps is pretty variable. I was lucky and stumbled onto a local family business, very friendly, always on time, so I used them again and again. Waste of time. Checked two fares on the site. Both time iRide were the ‘cheapest’ and the ‘best’. Two local mini cab company prices showed up with prices. Called them directly. Prices were 40% cheaper when calling them direct compared to the viewed price on the website. The people behind this comparison site think we are suckers. They got a chance and blew it. HFP needs to be very careful with what it puts on here otherwise you’re going to get the Queen eye roll when Charles called her mummy. So HFP start doing more due diligence on what it pushes on to us otherwise they will start to become just another clothes horse. Minicabit has a good reputation, we did have a dig. I just priced up an upcoming trip to Gatwick – cheapest fare was £10 more than my local cab company were quoting. London has better options than Minicabit. Even if I were to book, Icould not see where to enter your promo code. Once you’ve created an account you can enter it under ‘additional info’ on the payment page. Is it another browser issue or are there only two articles today? A genuine question rather than moan! The IHG / Principal article was added during the day yesterday instead of leaving it for today as it was fresh news, but it counts as a Friday article and was only emailed out today. On the odd occasion I drop in an extra article during the day, we need to drop one the following day as the email system can only handle 3 per day. Thanks Rob. I hadn`t read the principle article! I used to use minicabit quiet often. They were the best option for pick ups from STN for me (not going to London) and other domestic airports. I’d use them again if going to a new place and wanting to avoid getting ripped off, and card payment up front is great. For local journeys I’d not even consider them — i’d pick up the phone to a company I know.